Santa's Visit Programme for 2018 has been finalised. He will be visiting streets in and around Chesham. 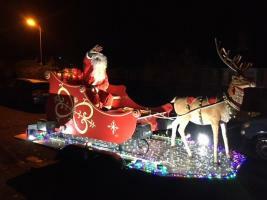 Organised by Chesham Rotary Club with fifteen local charities who will assist with Santa and his sleigh. Once you have followed the link you will see a login screen. Then click the login button. You should then see the details below. Click anywhere on the device as listed and this should then take you to the Santa Tracker where you will be able to see where Santa is located on the current route.